Here is an iconic season brought back to riveting life on its 50th anniversary. Gracefully told with unprecedented depth and detail and set against the roiling backdrop of the Vietnam War, the wonder of the moon landing and the music-filled mayhem of Woodstock, They Said It Couldn’t Be Done is the finely wrought, uplifting chronicle of a brilliant manager, Gil Hodges, and his overachieving roster of heroes, who together produced a triumph for the ages. "They Said It Couldn’t Be Done brilliantly brings an iconic baseball season to life, providing fresh insight into big names such as Gil Hodges and Tom Seaver as well as to some of the lesser-known players in that epic summer, such as Al Weis and J.C. Martin. 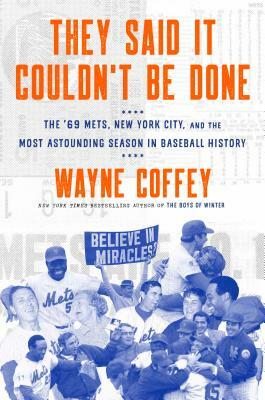 The book is a must-read for not just for Mets fans, but all baseball fans who will appreciate what indeed was the most astounding season in baseball history." "In 1969, while much of the world was transfixed by Neil Armstrong's 'one small step,' Queens was experiencing its own giant leap—a leap of faith with its baseball orange-and-blue. Wayne Coffey has always had his finger on the pulse of New York City and its sports, and his take on the 1969 Mets proves it. If you want to know what it was like to live and witness a baseball miracle in tumultuous times, this book is for you."